Andrei Zvyagintsev directs and co-writes this Russian suspense drama. Elena (Nadezhda Markina) is a former nurse now married to a rich husband, Vladimir (Andrey Smirnov). 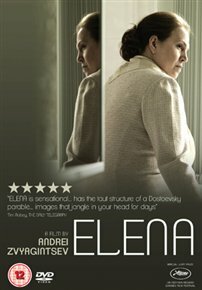 The middle-aged couple’s marriage comes under strain when Elena asks her husband to give financial support to Sergey (Aleksey Rozin), her unemployed son from a previous marriage, and his family. Vladimir refuses to help Sergey and goes further, changing his will to make his long-estranged daughter, Katya (Elena Lyadova), his sole heiress. Furious with her husband and with nowhere to turn, Elena decides to take matters into her own hands.